Many children dislike trying new foods. It can be a simple fear of the unknown. It could be they dislike the colour as it reminds them of other foods that colour they dislike, for example someone who’s tried and not liked tomatoes may not want to try red peppers. It may be the texture of the food that’s putting them off. Or the smell or taste that they are particularly sensitive to. If the child is able to vocalise their reasons, it’s worth asking them why they don’t want to try it, rather than pushing the issue. I recently discovered that the reason a 3 year old was refusing strawberries was that he’d been told not to eat the seeds of an apple and therefore did not want to eat a strawberry that was covered in seeds!! Once we asked him why- it made perfect sense! And we could explain to him that those seeds are OK to eat. If your child is not able to vocalise why, they often just offering the food regularly and not putting pressure on the child can work. But remember there are some foods, that like us adults, they simply won’t like! And that’s OK! I’m a tutor for children with Special Educational Needs (www.cheshiresentutor.com) and I love books and am especially fond of books that can help children make sense of our world. We’ve bought books for our children for most new situations such as Potty Training and gaining a new baby sibling. And I’ve always thought they are a brilliant way of helping to prepare children. 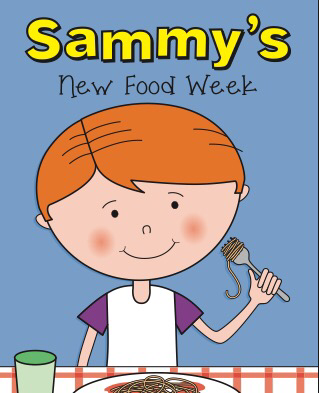 We’ve been reading ‘Sammy’s New Food Week’ a fantastic, beautifully illustrated book to help encourage and support children in trying new foods. The Rhymes- the words on each page rhyme which engages children further in the story. 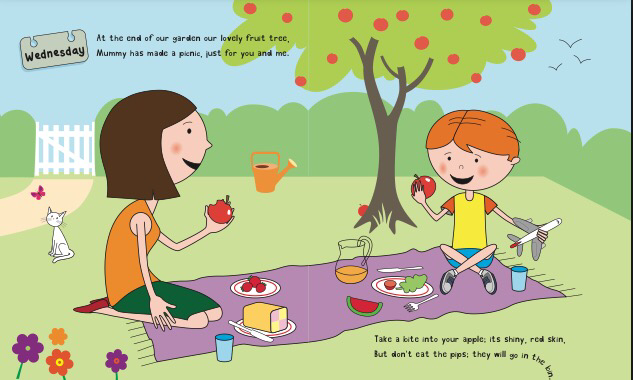 The choice of foods- the foods featured on each page are foods that your child is likely to come across. Making the book practical and realistic. Positivity- the characters are smiling, the pictures are bright and the language used it all positive-cheering children on to try new foods! ← Review: Angry Octopus Colour Me Calm, Colour Me Happy. By Stress Free Kids.